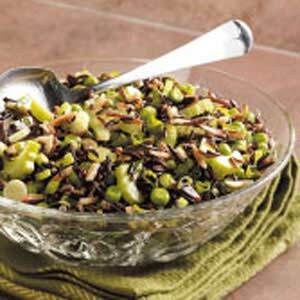 Asian Rice Salad Recipe that is delicious, nutritious and economical. What more could anyone want? Rice is one of the world’s most important foods. It is is a staple food of over half the world’s population. Only wheat is grown more. In Asia, rice is synonymous with food. Half of all rice is consumed within eight miles of where it is grown! Rice is easy to prepare, it has great flexibility, and it easily absorbs flavors while retaining its texture. Rice can be cooked in a variety of ways, including boiling, baking, roasting, frying, and pressure-cooking. Rice dishes can be spicy or tangy, savory or sweet. 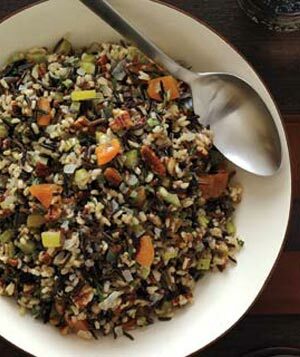 So behold: a rice salad that is delicious and wonderful to serve with a great many foods. 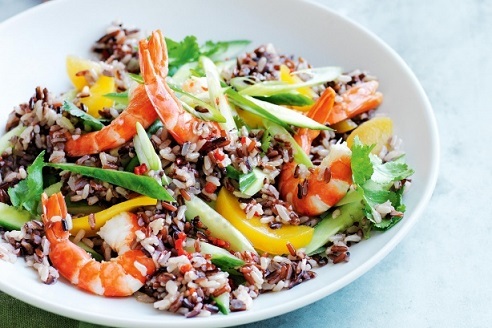 I like to prepare and serve this rice salad with Sesame Chicken or sauteed prawns. Preparation time: 30 minutes + rice cooking time. Serves 4. Enjoy your Salad and the company of those you share it with!